These highlights do not include all the information needed to use ISOSULFAN BLUE INJECTION 1% safely and effectively. See full prescribing information for ISOSULFAN BLUE INJECTION 1%. Isosulfan blue injection 1% upon subcutaneous administration, delineates the lymphatic vessels draining the region of injection. It is an adjunct to lymphography in: primary and secondary lymphedema of the extremities; chyluria, chylous ascites or chylothorax; lymph node involvement by primary or secondary neoplasm; lymph node response to therapeutic modalities (1.1). Isosulfan blue injection 1% is to be administered subcutaneously, one-half (1/2) mL into three (3) interdigital spaces of each extremity per study. A maximum dose of 3 mL (30 mg) isosulfan blue is, therefore, injected (2.1). Hypersensitivity to triphenylmethane or related compounds (4). Life threatening anaphylactic reactions have occurred after isosulfan blue injection 1% administration. Monitor patients closely for at least 60 minutes after administration of isosulfan blue injection 1% ( 5.1). The admixture of isosulfan blue injection 1% with local anesthetics results in an immediate precipitation of 4% to 9% drug complex. Use a separate syringe for anesthetics ( 5.2). Isosulfan blue injection 1% interferes with measurements in peripheral blood pulse oximetry. Arterial blood gas analysis may be needed ( 5.3). Hypersensitivity Reactions: Hypersensitivity reactions occur in approximately 2% of patients and include life threatening anaphylactic reactions with respiratory distress, shock, angioedema, urticaria, pruritus. A death has been reported following IV administration of a similar compound (6). No drug interactions have been identified for isosulfan blue injection 1% (7). Caution should be exercised when isosulfan blue injection 1% is administered to nursing mothers ( 8.3). Safety and effectiveness of isosulfan blue injection 1% in children has not been established ( 8.4). Isosulfan blue injection 1% upon subcutaneous administration, delineates lymphatic vessels draining the region of injection. It is an adjunct to lymphography in: primary and secondary lymphedema of the extremities; chyluria, chylous ascites or chylothorax; lymph node involvement by primary or secondary neoplasm; and lymph node response to therapeutic modalities. Isosulfan blue injection 1% is to be administered subcutaneously, one-half (1/2) mL into three (3) interdigital spaces of each extremity per study. A maximum dose of 3 mL (30 mg) isosulfan blue is, therefore, injected. 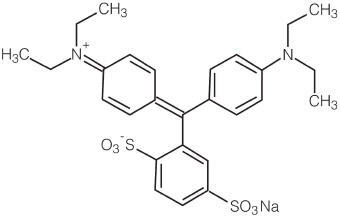 Isosulfan blue injection 1% is contraindicated in those individuals with known hypersensitivity to triphenylmethane or related compounds. Life threatening anaphylactic reactions (respiratory distress, shock, angioedema) have occurred after isosulfan blue injection 1% administration. Reactions are more likely to occur in patients with a history of bronchial asthma, allergies, drug reactions or previous reactions to triphenylmethane dyes. Monitor patients closely for at least 60 minutes after administration of isosulfan blue injection 1%. Trained personnel should be available to administer emergency care including resuscitation. The admixture of isosulfan blue injection 1% (with local anesthetics (i.e. lidocaine)) in the same syringe results in an immediate precipitation of 4% to 9% drug complex. Use a separate syringe to administer a local anesthetic. Isosulfan blue injection 1% interferes with measurements of oxygen saturation in peripheral blood by pulse oximetry and can cause falsely low readings. The interference effect is maximal at 30 minutes and minimal generally by 4 hours after administration. Arterial blood gas analysis may be needed to verify decreased arterial partial pressure of oxygen. Isosulfan blue injection 1% may also cause falsely elevated readings of methemoglobin by arterial blood gas analyzer. Therefore, cooximetry may be needed to verify methemoglobin level. Hypersensitivity Reactions: Case series report an overall incidence of hypersensitivity reactions in approximately 2% of patients. Life threatening anaphylactic reactions have occurred. Manifestations include respiratory distress, shock, angioedema, urticaria, pruritus. A death has been reported following administration of a similar compound employed to estimate the depth of a severe burn. Reactions are more likely to occur in patients with a personal or family history of bronchial asthma, significant allergies, drug reactions or previous reactions to triphenylmethane dyes [see Warnings and Precautions (5)]. Laboratory Tests: Isosulfan blue injection 1% interferes with measurements of oxygen saturation by pulse oximetry and of methemoglobin by gas analyzer [see Warnings and Precautions (5)]. No drug interactions have been identified with isosulfan blue injection 1%. Because many drugs are excreted in human milk, caution should be exercised when isosulfan blue injection 1% is administered to a nursing mother. Safety and effectiveness of isosulfan blue injection 1% in children have not been established. 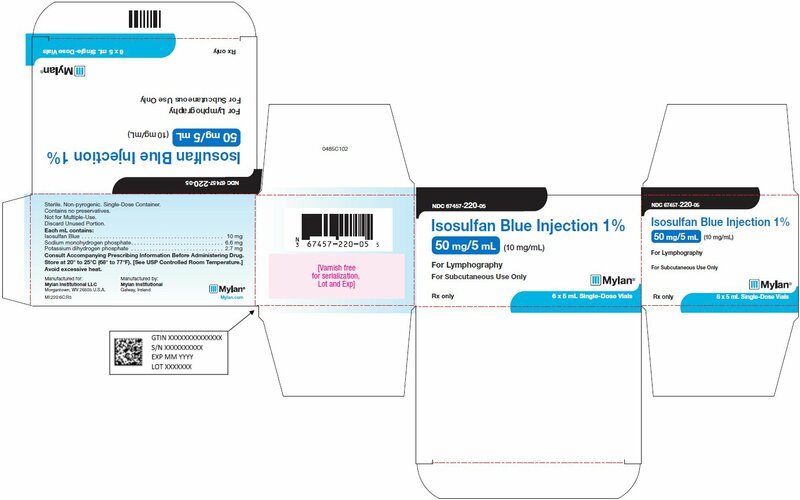 Do not exceed indicated recommended dosage as overdosage levels have not been identified for isosulfan blue injection 1%. Isosulfan blue injection 1% is a sterile aqueous solution for subcutaneous administration. Phosphate buffer in sterile, pyrogen free water is added in sufficient quantity to yield a final pH of 6.8 to 7.4. Each mL of solution contains 10 mg isosulfan blue, 6.6 mg sodium monohydrogen phosphate and 2.7 mg potassium dihydrogen phosphate. The solution contains no preservative. Isosulfan blue injection 1% is a contrast agent for the delineation of lymphatic vessels. Following subcutaneous administration, isosulfan blue injection 1% binds to serum proteins and is picked up by the lymphatic vessels. Thus, the lymphatic vessels are delineated by the blue dye. Up to 10% of the subcutaneously administered dose of isosulfan blue injection 1% is excreted unchanged in the urine in 24 hours in humans. Long-term studies in animals have not been performed to evaluate the carcinogenic potential of isosulfan blue injection 1%. Reproduction studies in animals have not been conducted and, therefore, it is unknown if a problem concerning mutagenesis or impairment of fertility in either males or females exists. Pregnancy Category C. Animal reproduction studies have not been conducted with isosulfan blue injection 1%. It is not known whether isosulfan blue injection 1% can cause fetal harm when administered to a pregnant woman or can affect reproduction capacity. Isosulfan blue injection 1% should be given to a pregnant woman only if clearly needed. Isosulfan Blue Injection 1% is supplied as a 5 mL single-dose vial, 1% aqueous solution in a phosphate buffer prepared by appropriate manufacturing to be sterile and pyrogen-free. Storage: Vials should be stored at 20° to 25°C (68° to 77°F). [See USP Controlled Room Temperature.] Avoid excessive heat. Inform patients that urine color may be blue for 24 hours following administration of isosulfan blue injection 1%. Consult Accompanying Prescribing Information Before Administering Drug.